I'm in an ongoing debate with John Williams, a fine fellow who runs the Second Pass website, over the New York Times plan to charge for NYTimes.com. a) Yes, it was wrong of me to call your presumed belief that prices are based on value rather than supply-and-demand "childish". However, your first original post to me was slightly derisive as well ("I know I'm 35 going on 95, but this still makes me shake my head ..."). In other words, "you started it". But I will be more careful with my words from now on. There have been plenty of cultural developments that I love in the past 10 years: Netflix, iTunes, The Wire. One way or another, I pay for all of them. Just as we can name things of value that we pay for, we can also easily name things of value that we don't pay for. "The Office". Music on the car radio. Outdoor sculptures and great urban architecture. Oh yeah, and then there's free news and commentary on the Internet which, plain and simple, we are already not paying for. I wasn’t trying to imply that consumers have to pay money for everything of value. Though I will say that in the case of everything Asher listed, someone gets paid. The architects, the builders, the actors, the DJs, the car-radio manufacturers—even, in the case of the web, the most prominent news bloggers (most of whom are simply aggregating news from more traditional sources, like the New York Times). But the fact that we indirectly "pay" for free advertiser-supported content does not support your argument in any way, because the New York Times currently is advertiser-supported -- not just the website but the newspaper as well. Both the website and the newspaper make most of their revenue from advertising. Our main argument here is subscription revenue models vs. advertising revenue models on the web. I feel as if you're trying to caricature me as some Chris Anderson sign-carrying information hippie, which I may even be when I feel like it. But it's wrong for you to suggest that I am arguing against economic common sense. I'm simply saying that a subscription-based model is the wrong choice for a property like the New York Times. New York Times management knows that a web paywall is a bad business move right now. The market is not strong for paid content and there is no foreseeable way they will profit from this. Erick Schonfeld from TechCrunch ran the numbers, and his findings are quite conclusive. 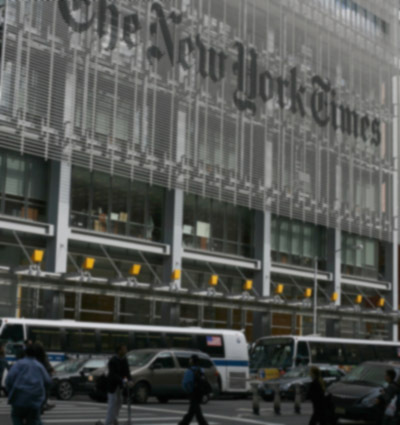 Even in the best case scenario, the added revenue from a few hundred thousand annual subscription fees will not add up to a significant amount on the New York Times balance sheet. And it certainly will reduce pageviews. Meanwhile, the major Long Island newspaper Newsday's recent payment plan has just been inadvertently revealed to be a disaster. 35 subscriptions sold. Total. I say the New York Times is fronting with their paywall press release. They have no plan for really risking their advertiser revenue, for exactly the reasons TechCrunch states above. The real goal of their press release was the press release itself. They wanted to "throw down", to make a statement, to appease loyal readers (like you, John Williams) who would actually want to pay a subscription fee to support the New York Times. Maybe they even hoped to inspire a rush to the barricades among the smaller newspapers. Forget the symbolism -- run the numbers. Read the TechCrunch piece. It seems highly unlikely that the New York Times will put a payment wall up over a high-traffic portion of the site anytime soon, because pageviews are the hot currency right now and they won't have the heart to give up their pageviews. So it's a phony press release. This is why they've been has so hilariously vague about timing. Sometime in 2011? They already have the technical infrastructure in place -- they could switch a payment wall on next week if they thought it would work. Look, maybe web payment/subscription models will succeed someday. That's fine with me if they do. But the New York Times executive staff knows this is a loser plan, and I'm calling them on it. Don't listen to what they say -- watch what they do. c) Okay, maybe I'm "throwing down" myself when I say I'll end my lifelong relationship with the New York Times if they put up a paywall. I'm trying to be provocative, to make a statement. And I'm speaking as a blogger, not as a reader. As a reader: sure, I'll pick up a copy now and then. Sure, I'll browse that rag they run every weekend, the something something Book Review. I definitely will not subscribe online, though, and I don't think I'd continue to devote time to writing about them on Literary Kicks. But on the personal level, the Times will always be my hometown paper. Also good for wrapping paint cans, lining gerbil cages, etc. 3 Responses to "Throwing Down With the New York Times"
I agree with you -- I wouldn't pay for the NY Times online if it went that way. To me it would indeed be voluntarily making itself smaller. I don't get the comments by this fellow you are arguing with. It's simple opinion -- he says I think the New York Slimes online edition is worth paying for. Me, I say I don't think its worth it. But this is about a bigger issue than web surfers going over to read the paper on their computer having to pay for access. It's life or death for the Slimes and how to adapt or go extinct. I like the "NY Times" and I resent it being called "the Slimes". I also like the print media because one may hold it in your own two hands. I know the "NY Times" is "conservative" to some folks and "liberal" to others. I like to think of the NY Times as "America's print newspaper". Newspapers are a wonderful thing and are a part of America's culture. It really upsets me personally when any of them go by the wayside. Speaking of closings...I heard that the Pasadena Playhouse, an icon of theaters in the Los Angeles, CA area is closing because of the recession. It will soon have it's last play performed. When I was a young boy, I remember going to a play at that theater with my mother, before moving east. It's an end of an era. I wonder if anyone will buy it and save the venue.